"Historical record tells us that every fifteen years or so, Superman is re-imagined to address the wants and needs of a new generation. 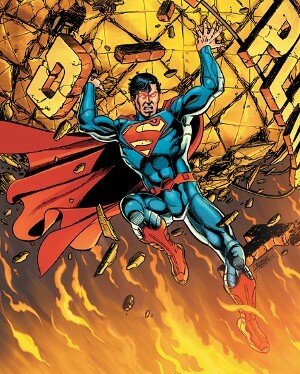 Fifteen years ago, John Byrne recreated Superman from the ground up. Fifteen years prior to that, Julie Schwartz and Denny O'Neil engineered the biggest shakeup since Mort Weisinger began bringing in all his familiar lore fifteen years previous. "That fifteen year cycle is upon us again. With all due deference and heartfelt thanks to the creators of all the fine work done since the Byrne revamp, it seems that many of the social trends and historical currents which made those comics so appropriate and so successful in the '80s and early '90s have now been replaced by newer, different trends and currents. Sadly, sales would seem to reflect our contention that new times demand fresh approaches. "We believe that the four of us understand the new face of Superman: a forward-looking, intelligent, enthusiastic hero retooled to address the challenges of the next thousand years. The ultimate American icon revitalized for the new millennium as an aspirational figure, a role model for 21st Century global humanity. "The Superman relaunch we're selling bucks the trend of sweeping aside the work done by those who came immediately before. 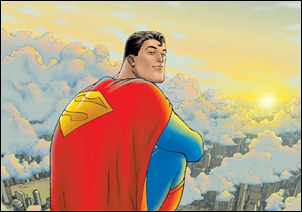 Unlike the 'cosmic reset' revamps all too prevalent in current comics, our New Superman approach is an honest attempt to synthesize the best of all previous eras. Our intention is to honor each of Superman's various interpretations and to use internal story logic as our launching pad for a re-imagined, streamlined 21st century Man of Steel. The 'cosmic reset' notion has been replaced by a policy of 'include and transcend' with regard to past continuity. "Our intention is to restore Superman to his pre-eminent place as the greatest super-hero of all and to topple Spawn and every Marvel comic that's currently in his way. "We don't think this will be much of a problem." The project was given the green-light, and the team's tenure as collaborative writers was scheduled to begin with new editor Eddie Berganza's first issue. Vacationing DC editor Mike Carlin then returned from vacation and was shocked to discover that big changes were being implemented to Superman without his knowledge. He vetoed the project, leaving Eddie to quickly find an alternative creative team before his first issue hit. At this time, DC also adopted a policy of prohibiting "big name creators" from working on their core Superman and Batman books. "We had the 21st-century Superman, we had four guys who'd been waiting all their lives to do this, we wanted to launch in January 2000, and we'd have sold a million copies. It would have been the coolest, biggest thing to happen to Kal-El since the Byrne revamp, and DC blew it. I have nothing but respect for Joe Kelly and Jeph Loeb and the other guys currently on the books, but they haven't been allowed to go far enough, and as a result, the current revamp seems a little muted. Not being able to do Superman and not being offered anything else at DC was the main reason I decided to do Marvel Boy for Jimmy Palmiotti and Joe Quesada." "One final little note, which has nothing to do with the fact that Grant wrote 'Animal Man' and Millar's a veggie, but is a matter for pure logic. Clark eats bouef bourginon? The man with a code against killing eats murdered animals? Regardless of his farm upbringing, can we justify a Superman this aware and attuned to life in all its forms being a carnivore? Though there's no need to make a direct, on-stage issue of it, file this thought away; his diet would be beans, pulses and windfall, if anything, and his body would be capable of extracting maximum energy from these simple foods if not solely from the sun's rays..."
"Superman's super-intelligence and increased speed of perception, etc., has left him with more time and brain cells to fill, so the Fortress becomes a place of baroque activity once more as Superman becomes the hobbyist par excellance, the polymath who's interested in EVERYTHING. The Fortress becomes trophy room, laboratory, gymnasium, observatory--the perfect hangout for the ultimate being. Let's see the Fortress stuffed with incredible artifacts from all space and time. 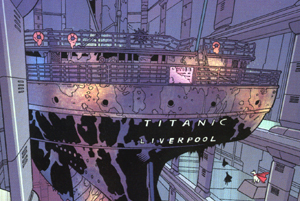 The Titanic hangs from the ceiling..."
"He was perched on a bollard with one knee drawn up, chin resting on his arms. He looked totally relaxed... and I suddenly realized this was how Superman would sit. He wouldn't puff out his chest or posture heroically, he would be totally chilled. If nothing can hurt you, you can afford to be cool." "We'd like to tweak the costume by finally getting rid of the red trunks. This gives us a new look which somehow recovers the more classic, Golden Age, 'primal' Superman look and feels like an update. This move also has instant media appeal: Finally, Superman is smart enough to wear his shorts UNDER his pants." 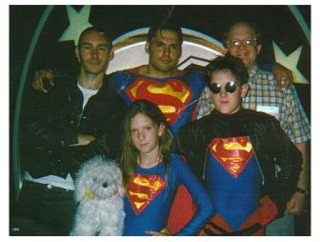 Grant Morrison is heavily involved in the 2011 Superman Re-Launch.